This course focuses on the practical and theoretical disciplines and processes within the field of games technology and provides you with the industry-standard software and technology skills necessary to forge a career in the games industry. 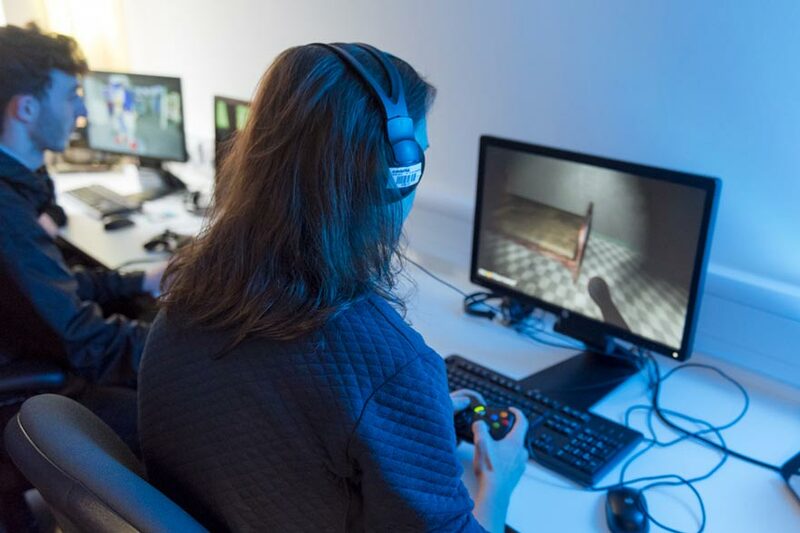 This degree enables you to develop a fundamental understanding of the core areas of games production including the generation of games design ideas, the production of games assets and the creation of playable games using industry-standard software and hardware technologies. You’ll develop experience of using industry-standard software, study workflow methods and the working practices required in the creation of a games product. You’ll complete a range of projects to help you understand the theoretical aspects of the games industry and the wider creative industries ensuring that you understand the job role requirements and legal and economic frameworks that you must work within. You’ll receive seminars, talks and live briefs from professionals currently working within the games industry, equipping you with the skills to become autonomous, self-directed industry professionals. The course content is focused on the exploration and development of specific software applications vital to games production that is enhanced by student-focused investigation into industry specialists. This enables you to develop an understanding of the core areas of games production, including product development, project management and manufacturing, alongside personal investigation of key digital technologies such as games engines, 3D software and animation hardware. This module introduces you to the technologies and practices that underpin the creation of a game technology product during its development phase. The module will introduce you to industry-standard games engines, tools and configurations while highlighting industry-standard workflow. Within the unit you’ll be introduced to a number of elements including development and purpose of game engines, the platforms which games appear, game engine implementation, game logic and flow, how games are affected by design considerations alongside an introduction to the various languages which games are written in. This module introduces you to audio and visual technologies and their use in the creation of assets for interactive games. This module will introduce the use of 3D modeling and animation software to create industry-standard visual assets to the correct technical specifications for implementation within a games engine. These assets will typically be environments, environment assets, weapons, characters and/or vehicles. Audio asset development will focus on a variety of audio production tools and techniques that will cover MIDI editing, music production and composition, Foley recording and performance, Foley sound design, voice acting, dialogue recording, editing and post-production. There will be an emphasis on workflow studies based on the use of specialist software, which will encompass different 3D modelling, texturing and rendering techniques. An understanding of the fundamentals of game mechanics is important in the creation of a games technology product. This module aims to provide you with the underpinning knowledge of games design and how technology decisions are influenced in relation to genre, target audience and gaming platform. You’ll be introduced to the processes involved in the initial creation of games concepts and development of interactive games through the study of Ludology and the use of gaming elements including rules and rewards. You’ll study the global and cultural development of games, the theory behind game mechanics and how that impacts on hardware and software. This module also aims to develop your understanding of the cultural significance, historical context and the traditional narrative structure of interactive games. You’ll be given the opportunity to develop an original game design which you’ll manage from the development process through to final realisation of a technology product. Understanding global markets and demographics is vital when developing games technology products, especially when identifying consumer trends and new market opportunities. This module aims to develop your understanding of the specific global models and the impact of social and economic processes involved in the creation of interactive video games. You’ll investigate specific technology issues that contribute to the growth of the games industry, such as hardware and software developments, platform specific issues and economic and social trends. 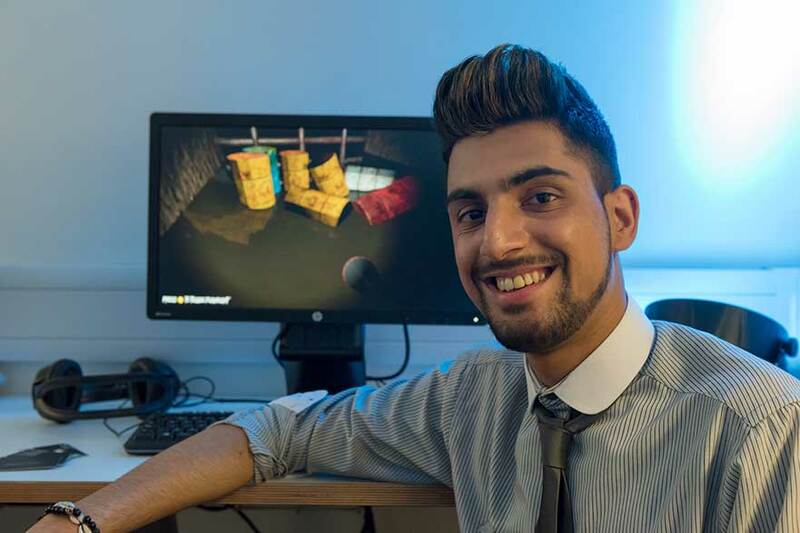 You’ll study a variety of business and legal aspects of the contemporary games industry. New law protocols, such as, intellectual property, ownership, development and publishing cycles, alongside business planning will form the core of the module, with instruction and analysis of industry standards in studio organisation and management, building upon your understanding of independent and AAA games studios. This module aims to build techniques and develop your understanding gained in the use of industry-standard games engines in the creation of a games level. Throughout this module you’ll be gathering resources in relation to the integration, creation and manipulation of original 3D assets within a relevant games engine, working towards the goal of developing an original functioning game sequence. You’re tasked with documenting, analysing and critically evaluating multiple research sources, justifying a specific engine preference, asset pipeline and workflow method for the creation of their game sequence. You’ll implement industry-standard project management techniques during the production of your level. The module focuses on contemporary techniques and practices integral in the production of an original level design in a modern games engine, from asset lists, games pipelines, workflow methods, time management and critical theory. The production and creation of an original video game level prototype will be integral to your analysis and progression in this module. This module will further develop and consolidate your technical knowledge of audio/visual theory and practice that was initiated in the Asset Production for Games module. You’ll be expected to undertake efficient coordination of resources and effective deployment of technology in order to create refined end products intended for a prescribed professional purpose. You’ll be introduced to advanced modelling and sculpting techniques and will be expected to use their initiative to effectively produce original 3D character models and environment models to an industry standard. Audio assets will focus on producing character Foley, recording dialogue and developing soundtracks. Assets created will to be to the correct technical requirements for implementation within a game engine. You’ll be expected to critically evaluate your work in professional terms, reflecting upon the theoretical knowledge and practical skills implemented in your portfolio piece. This module focuses on the creation of industry-standard technical documentation as part of the games development pipeline. This module will enhance your understanding and consideration of player interaction and the use of games mechanics in the development and realisation of an interactive game. You’ll be introduced to a range of techniques and processes involved in the development and realisation of computer games, including scripting techniques, level design concepts, user interface, scenario scripts, character realisation, narrative structure, cut scenes and use of dialogue/audio. You’ll look at the technical requirements of managing a games production and the planning of project management documents to evidence such industry-standard practices as software specifications, asset list and milestones. Following this, you’ll produce an industry-standard game design document for an original game concept. You’re required to show a clear progression within this technical documentation with consideration paid to emotional and psychological in-game triggers. The games design document will be used in the coordination of a games production and will feature in-depth guidelines for a development team in all parts of the production process. This module builds upon your existing 3D modelling practices to develop an industry-standard workflow and pipeline for asset creation. These 3D assets could be specific to but not limited to characters, weapons, vehicles and/or environments. You’ll achieve this via the use of a variety of state-of-the-art software tools and techniques. These will focus upon developing core 3D modelling principles and the implementation of custom shortcuts and interfaces via the use of 3D scripting languages. You’ll learn how to efficiently manage an asset development cycle which will include the planning and designing of multiple game assets, all to a set brief. You’ll look at architectural studies, product design, custom textures and materials alongside realistic lighting and rendering techniques in an industry-standard games engine. This module aims to develop and consolidate your knowledge of computer games engines focusing on scripted languages and specific level mechanics. Emphasis will be placed upon the understanding and implementation of custom scripting using industry-standard games engines to develop original gameplay segments alongside custom menus and UI design. You’ll explore the practicalities behind standard languages to create game sequences and set scenarios in place. You’ll critically analyse and evaluate the use of scripted sequences throughout the progression of video game development to demonstrate proficiency with script principles and programming knowledge. This module introduces you to advanced animation techniques specifically geared towards video games production. The techniques covered will allow students to develop physics based and keyframe animations in multiple contexts. In addition to this there will be emphasis placed upon the use of motion capture hardware and software in the games industry. The focus of study will be on learning and implementing asset and character animations into industry-standard game engines. You’ll need to develop and refine skills in all areas of game animation, including researching current trends and techniques used in the industry, kinematics, animating from observation and imagination, pre-production and post-production techniques. This emphasis on planning, developing and the integration of original animations for games, including character, vehicle and weapon animations will aid your understanding of the processes needed to produce industry ready cut scenes, cinematic, trailers and dynamic in-game assets and events. Utilising a broad range of skills, from 2D drawings to advanced 3D software techniques you’ll have the opportunity to create visually striking original work, which highlights the power and complexity of contemporary games engines. You’ll be introduced to a range of software and pipeline processes within the modern games technology industries. This will allow you to form a solid understanding of industry roles which in turn will lead you to specialise within your chosen games technology field. The modern global games industry is built on the use of the latest hardware, software and technology and the introduction of current industry-standard practices and workflow will be at the forefront of delivery. The course aims to be responsive to the needs of both the UK and global games industry and provide students with the current relevant skills required by both Indie and AAA employers. You’ll learn through a range of conventional classes including IT lab sessions, workshop sessions, lectures, seminars, and tutorials. You’ll also have the opportunity to engage in unique opportunities that are designed to develop your personal and employability skills. These include working as a team, independent learning, visiting industry professionals, working on live briefs, testing games and going on a range of enrichment field trips. 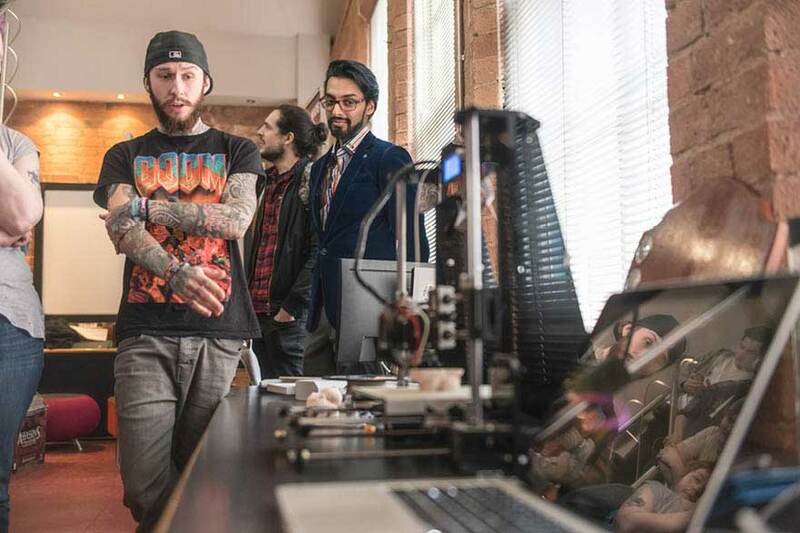 On this game technology degree, students are connected with the games industry and have the opportunity to attend games festivals and experience guest lectures from industry professionals. As well as lectures and seminars, you'll also gain hands on experience through games testing, live briefs and field trips. Our graduates have gone onto employment with notable games companies, such as Rockstar Games, Ubisoft BlueByte, Codemasters, Sumo Digital, Quantic Dream, Riot Games and more. Previous graduates have worked at companies, such as Rockstar Games, Ubisoft BlueByte and Sumo Digital. Get your hands on state-of-the-art games technology, such as virtual and augmented reality hardware and software.